Over at An Island Life, I’m having a giveaway for a soy candle & a Look Better Naked set – a 6.25 oz. Mineral Body Scrub, 5 oz. Mineral Body Mask and 4. oz. Rich Body Creme. To enter, just stop by Allizon.com and check out her site. Then leave a comment on the giveaway post saying how you think the site could be improved. Allison herself will select a winner. Do you have a creative mind? Then this could be the contest for you. Looking Towards Heaven holds a weekly contest called What The?! where she posts a closeup of a photo for readers to guess what it is. Weekly winners are then entered for a monthly prize. To view this week’s photo, stop by here. Living a Mom’s Life is giving away a Monogrammed Sweater – perfect for this winter weather. To enter, just mention this giveaway on your blog and let her know what your favorite item is from her online shop, My Little Monkey Boutique. Deadline is February 8th. This is for all the animal lovers out there. So A Blonde Walks Into a Review is giving away a $75 gift certificate to Peternity. Peternity specializes in pet memorials and gifts that helps you honor your pet for eternity. Deadline to enter is February 5th. You could win a copy of Touchpoints Your Child’s Emotional and Behavioral Development from Birth to Three by Dr. T. Berry Brazelton from Healthy Moms. Just fill out the entry blank and link back to the giveaway from you blog before February 8th. Are there photos you still haven’t printed out because of the high cost of ink? Well, here’s a contest just for you – Pricey Ink You’re Fired! Photo Contest. Submit your favorite photo or video and you could win a trip to the NASCAR Sprint Cup Series™ race at Chicagoland Speedway® on July 12th, 2008, plus a KODAK EASYSHARE AiO Printer autographed by Donald Trump! You have until March 1st to enter. Even if you can’t make it to Hawaii this winter, you can still enjoy some of our local products. Go Visit Hawaii is giving away a Hawaii-themed fun pack to one very lucky winner. Stop by for all the info. How would you like to win a trip for 2 to the 2008 Olympics in Beijing, $6000 spending money, and have your face on the U.S. Olympic Team packaging? Tyson Foods & former Olympic Gold Medalist Mary Lou Retton are sponsoring the Gold Medal Mom Contest. From now till March 31, you can nominate your Gold Medal Mom by uploading a video or a photo and submitting an essay. Then, from May 11 to June11, America will vote for one of the 25 finalists. Here’s a great creative take on a contest and it’s easy to play. All you have to do is visit Bullfrogs and Butterflies and hunt for the Easter egg. Once you find it, click on it and you will be taken to the contest’s rules and registration page where you can enter to win a FREE Easter themed jon jon romper. Deadline is midnight CST on February 10th. The South Beach Diet: The Delicious, Doctor-Designed, Foolproof Plan for Fast and Healthy Weight Loss from Lookit! I Spy . . . Growing in Grace is “a mother-daughter ministry publication that desires to bring encouragement to relationships in the lives of women of all ages.” Stop by and read all the great posts & contests they have going on. 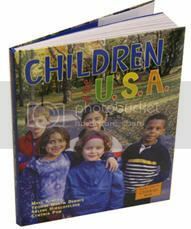 Last week, I mentioned a new book coming out called Children of the U.S.A. by Maya Ajmera, Arlene Hirschfelder, Yvonne Wakim Dennis, and Cynthia Pon. “This book celebrates the diverse tapestry of sounds, flavors, histories, geographies, and religions that enrich this nation. It tells the stories of hope and unity that draw people together from different backgrounds.” It’s now onsale at The Global Fund for Children. Ever thought of doing a time capsule for your children to visit sometime in the future? Well, The One Hundred Year has just made it easier to do. This site allows people to put together an online Time Capsule and build it up through the years, kind of like a digital diary. The cool thing is that you can include a wide variety of formats – text, music, video, web grabs and photos. What a great way to share a legacy. According to the Substance Abuse and Mental Health Services Administration, every day 2,500 youth age 12 to 17 abuse a pain reliever for the very first time. To address this growing problem, ONDCP has launced a campaign to help parents and communities combat this troubling trend. The centerpiece of the campaign is the new Rx Drug section on Parents The Anti Drug site which features an interactive house tour highlighting locations where teens can find prescription and OTC drugs, tips for parents on how to prevent abuse, and much more. You can also view a quick rundown of the issues and what parents can do here. One of the great things about blogging is the ability to connect to a wide range of people who otherwise may not be reachable. Kellie of Living in Grace has found out that she needs a kidney transplant and is asking for your help. If you or anyone you know are interested in being a living donor, please contact her. At the very least, stop by and send her your prayers and positive thoughts. SuperFundraiser.com – a unique system that will match your group with easy, profitable fundraising programs based on your unique needs and preferences – is up for sale. If you’ve been thinking of getting into professional blogging, check out the listing here. Get a free box of Fiber One Caramel Delight Cereal. Yum! If you love TrueJeans but thought they weren’t quite right for your size, here’s some exciting news. TrueJeans proudly announces the release of two new styles for plus sizes – Svoboda & Jag Jeans. These jeans are still in the beta stage so any input from you would be greatly appreciated. As an incentive, TrueJeans is offering free shipping, exchanges and returns on all plus size purchases as well as an extra 15% off checkout code “PLUSPROMO”. To order you pair, stop by the TrueJeans online site today! Kailani ~ thanks for including my giveaway in this week’s edition of 5 Minutes Around the Blogosphere 🙂 I am getting a lot of visits and entries from your readers. Good luck to everyone! I didn’t know there was so many opportunities for FREE stuff! Don’t we all love FREE?? Thanks for the great info. Thanks so much for the shout-out, Kailani! You’re the best! thank you sooooo much for featuring my giveaways kailani + 5mfm!!! i love your blogs!!! Thanks for all the great contest info. I wanted to thank you for all of the posts you have put up here. It’s a lot of work! I really enjoy reading them and going to all of the links you have put up. Thanks for the TrueJeans info. I am going to look into them! Also, thanks for pointing me to Kellie at Living in Grace. I am not ready to be a kidney donor, but I am praying for her and for God to prepare the way.